I struggled to find the right design for this quilt challenge. I had sketched a quilt called “The Three Bears” with three bear’s paw blocks, but settled on a quilt celebrating my love of my name, Mama Bear, and my love for quilting. You can read more about the design process here. The quilt measures 54 inches by 54 inches. 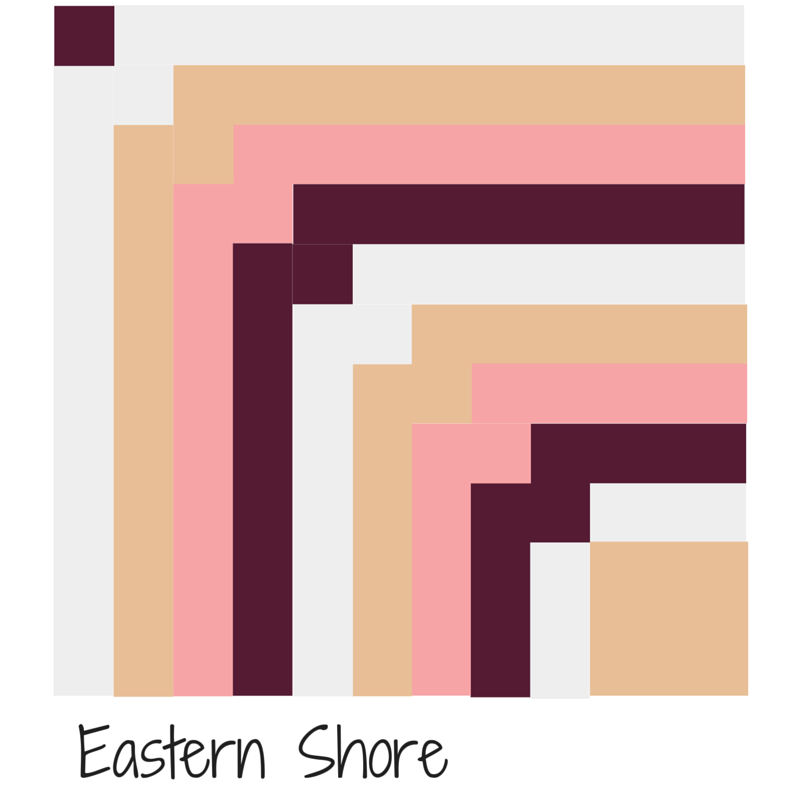 I’m entering it in the 2015 Pantone Quilt Challenge, Marsala, hosted by On the Windy Side and Play Crafts. The Bear’s Paw block is typically made with a square as the paw of the bear and the half-square triangles as the “claws”. I machine quilted “paw” prints, instead of pieced squares adjacent to half-square triangles. I chose prints in paisley, feathers and geometric circles for the “claws”. 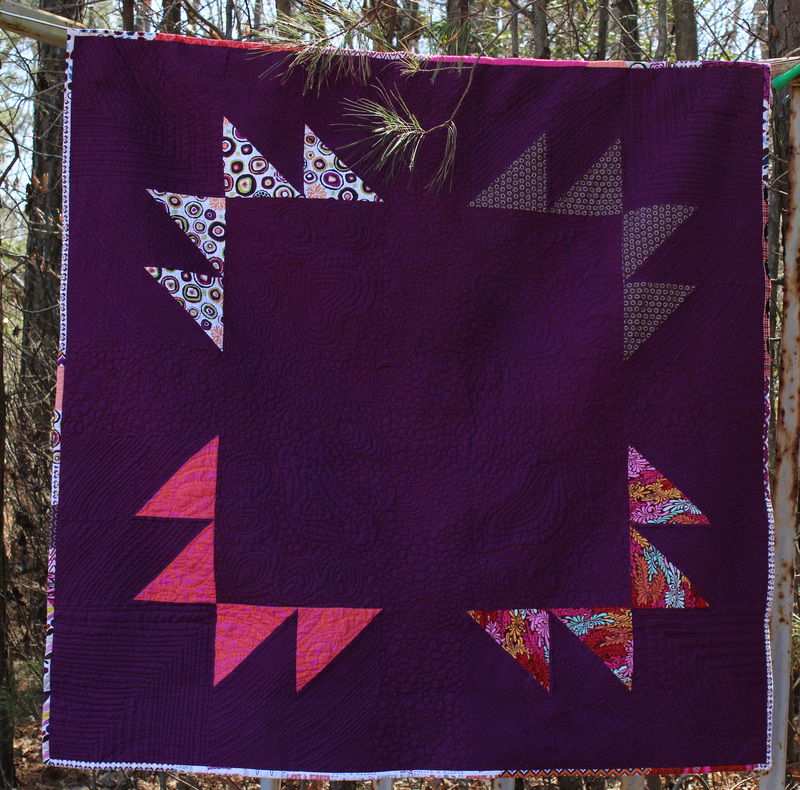 The Marsala color was the perfect choice for this quilt. 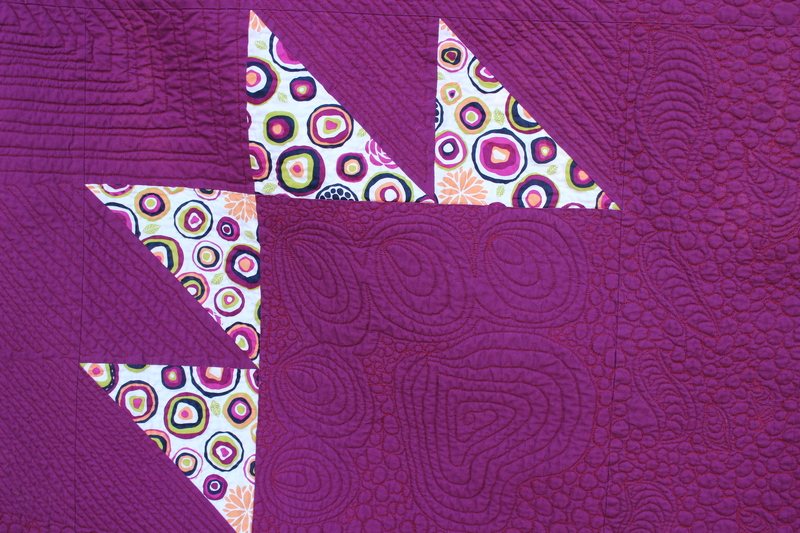 Close up of the free motion quilting. The bear paw footprints are surrounded by pebbles and pea pods. On the back of the quilt I used a variety of Marsala-inspired fabrics as well. The quilting really shows up on the back. Marsala is a great color to wear as well. Check out this site for tips on wearing marsala. That detail makes the quilt for me. Without it I don’t think it would have been as wonderful. You were very buzy Wanda… wonderful quilting & colours! Thanks. I’ve gotten so much better at free motion quilting. Cool design, and i really love the back where you can see the ‘line’ of the quilting. I’ve noticed modern quilts typically don’t show the quilting but the thread matches the fabric color. 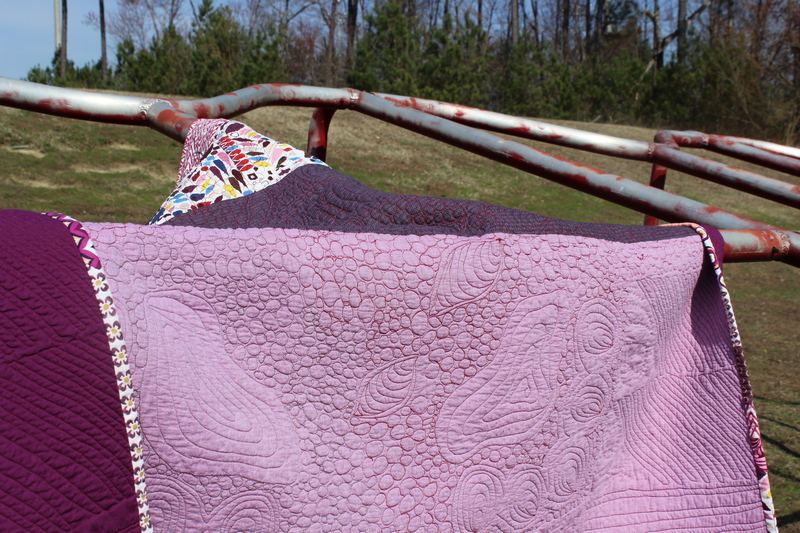 I guess it just depends on the quilt whether you want the quilting to show or not. Oh Wanda! I LOVE this!! I love the story with it! I love the quilted paws! And I love the serendipity in the binding!!! Serendipity gets me every time. Wow – the quilting on this is just stunning! Great work! Oooh that bear paw in the quilting totally gets me! I loved reading the sweet story behind this quilt as well. What a beautiful quilt! Thanks, Anne, for hosting this challenge. I’m so glad I participated.